Outdoor Style Australia is owned and run by husband and wife team, Doug and Andrea Anderson. It is a family business located in the Blackall Ranges of the Sunshine Coast Hinterland. 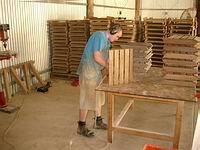 The staff at Outdoor Style Australia are involved in every step of production. From design, to machining, assembly, finishing, and finally oiling to highlight the timber's natural grain. 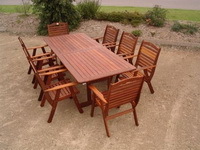 This enables us to provide superior quality outdoor furniture at very reasonable prices. The fittings used in our construction are resistant to corrosion and our entire range comes with a standard 2 year warranty. All Kwila that we use is kiln dried to avoid any twisting or warping and to ensure maximum strength and durability.